Rejoice! Thursdays is never the same! 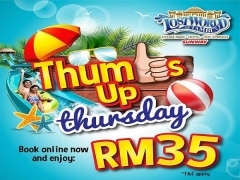 An entire day of fun and adventure at RM 35.00 on SELECTED Thursdays for each month. Plus! ‘50% OFF’ to our Haunted Chambers for the first 100th guests! *. Now isn’t that a Thumbs-Up to your Thursday?! Purchase now! This promotion is ONLY valid on selected dates. This promotion is ONLY valid for ONLINEPurchase. * ‘50% OFF on Haunted Chamber‘ for the first 100th guests to redeem at Haunted Chambers counter. First come first serve basis. Check out Sunway Lost World of Tambun for more details about this offer and to book your tickets now!